To mark the fourth anniversary of the repose of His Holiness, Patriarch Alexy II of Moscow and All Russia (1929-2008), we offer the following reminiscences of Archpriest Vladimir Vigiliansky, recorded several months after the Patriarch’s repose. 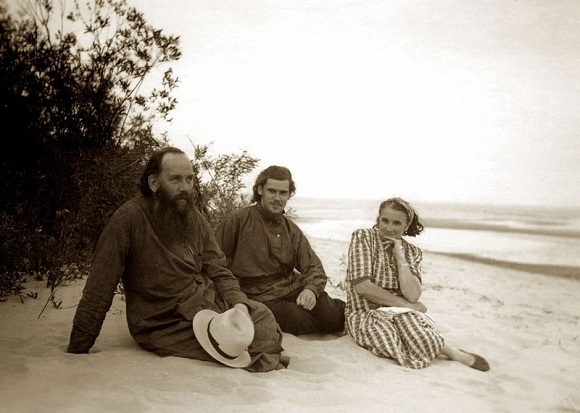 The future Patriarch with his parents, Archpriest Michael and Matushka Elena, on the banks of Lake Peipus, 1955. Before entering the priesthood, I worked professionally in the literary world, for which reason I still have a writer’s view of events and people. It is possible that what I will say about His Holiness, Patriarch Alexy, will be seen more through the eyes of a writer than those of a priest. I can repeat the same things other priests and bishops have said, but I will also say things that others might not have seen or known. The first thing I noticed when I had only just met His Holiness the Patriarch, after the first two or three words, was an otherness about his countenance. He was a different kind of person, even among those of like mind, fellow men of prayer, people of his generation. I was always trying to understand what was different about him and why, what the nature of this otherness was. Now I can articulate it as follows. He was unique for his generation, because he was raised outside Russia, outside the Soviet system, outside the context of Soviet life. This was absolutely not the same environment as that in which his generation lived. He was born and raised in the emigration, surrounded by bourgeois Estonians and Russian émigrés, belonging to a very well-known noble family that had served the Tsar and Fatherland for many generations. This family was different, other, non-Soviet; he, its offspring, was a nobleman not so much by birth as by inner essence and mentality. And this did not wear off during the following sixty years he spent on the territory of the Soviet Union. This was the first thing, and it was very important. Second. 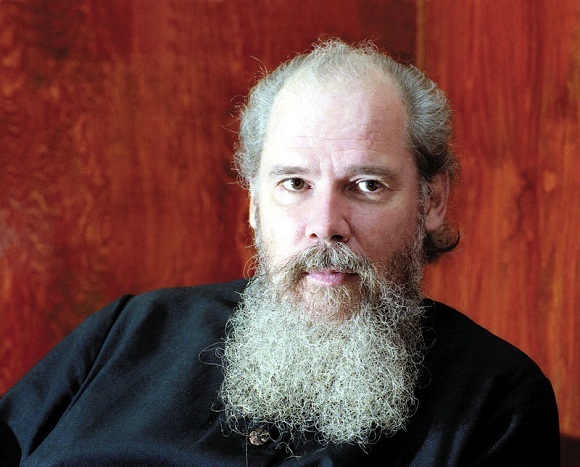 Another feature connected with his biography and also quite important for understanding his cast of mind and understanding of life is that he was a monarchist (as was, incidentally, another émigré: Metropolitan Anthony of Sourozh) and from a family of monarchists. He never overemphasized this fact or spoke of himself as a monarchist, but it is evident from many of his pronouncements as well as from his behavior. Moreover, he was the grandson of a White Guardsman who had been executed. His biographical details, to which the Soviet personnel department paid so much attention, were quite out of the ordinary. Most important, as a youth he made his choice in extreme circumstances. He left Estonia in 1946, leaving behind the family of his parents, to set out on the path of the priesthood and to enter the Leningrad Theological Seminary. Today this seems completely run-of-the-mill, but in the conditions of 1946 this was a real choice. If we were to retrace the (then) twenty-five year history of the Soviet state, this meant choosing a life of suffering and the crown of martyrdom. Those who know the history of Russia will understand that in Soviet times the clergy were almost completely wiped out: the majority were shot, many perished in the camps, and very few such people survived. By 1946 not everyone had yet been released from prison: despite Stalin’s favorable attitude to the Church beginning in 1943, thousands remained in the camps. The future Patriarch set out on this path, knowing that the graves of tens of thousands of clergy who had recently suffered had not yet grown over. He had a “terrible” profile. We should also take into account that – strictly speaking, in Soviet terms – he and his father were collaborators: they lived on occupied territory and negotiated with the German authorities to visit the prisoner of war camps. Under the conditions of the Soviet life of that time, that was quite simply a death sentence. As such, the choice he made at the age of seventeen was one that defined not only his life, but also his character. His origins, his ancestors, his biography – all this, of course, left their mark on this person who would become the bridge between pre-revolutionary Russia and our times. The emigration had kept the best, the most valuable, the most important, and the most imperishable and living parts accumulated by Russia before the catastrophe of the revolution. The émigrés kept all this in their hearts, distilling it, removing all that was extraneous and wasteful, leaving only the grain. And they passed this grain on to their offspring. 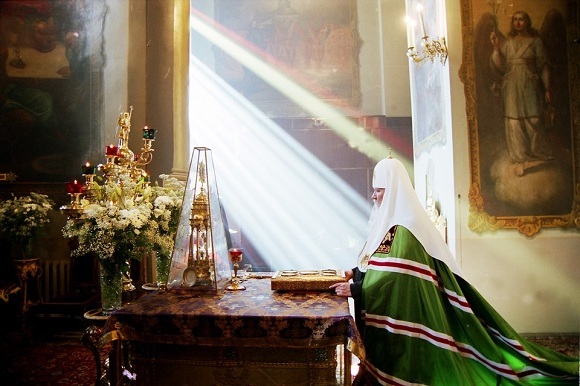 His Holiness, Patriarch Alexy, was someone who became an expression of the Russian world, in its holy sense, that we both preserve and do not know – we only hear echoes and see faint reflections of it in various aspects of modern life. But he was a bearer of this world, a bridge between “this” and “that,” a manifestation of this Russian world. In fact, through him we could judge what we had lost. There are practically no such people left, apart from elderly émigrés who still live in the West. 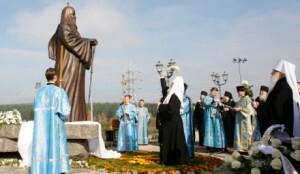 The Patriarch was the connecting link between the part of the Russian people that kept Russia, faith, and Orthodoxy in their hearts here and those who were scattered throughout the world, because he was a representative of that divided Russia, of the emigration. His otherness was clearly manifest in his character, which was unique and entirely unlike that of other people. For example, I have never met anyone in my life in whom the ability to wait patiently and to restrain their first reactions to one thing or another was so well developed. He was a remarkably courteous and considerate person. Having studied his character and tastes, I knew for certain that the Patriarch did not like the behavior of certain people, did not like words that were spoken to him, or mannerisms and actions that took place before his eyes. But never in his life did he give it away. This shows remarkable self-control, a keen understanding of life, and the knowledge that first reactions can never help change a situation. In order to address the situation, he would wait to find a delicate means, a good time, and the necessary words spoken in the right time and place. I do not know anyone else who was so patient and self-restrained, who knew how to wait before expressing a carefully rendered opinion in regards to circumstances, people, or ideas. I was not the only person who saw that he was not like all the others; many other people saw this as well. Sometimes they did not understand or could not explain what stood behind him, but they could sense that it was an expression of something greater, of some great treasure. Once I was part of a group accompanying the Patriarch in Strasbourg. A year before his death, when His Holiness was visiting the European Parliament in Strasbourg, France, to speak at an assembly, we walked from one building to another through passageways, elevators, stairways, and halls. This march took twenty or twenty-five minutes. I walked behind His Holiness the Patriarch and observed how people rushed to see him from their offices, or stood watching somewhere in the hall, or encountered him in the hallway. I saw roughly the same expression on all these people’s faces, one that combined delight, surprise, and fear. I saw from their faces that they were seeing something for the very first time. I gave it some thought, trying to answer the question: what is it that they see? Then I tried to look at the Patriarch through different eyes, through the eyes of these foreigners. Exotic clothing or appearances do not impress Europeans – in this sense, they are quite experienced. 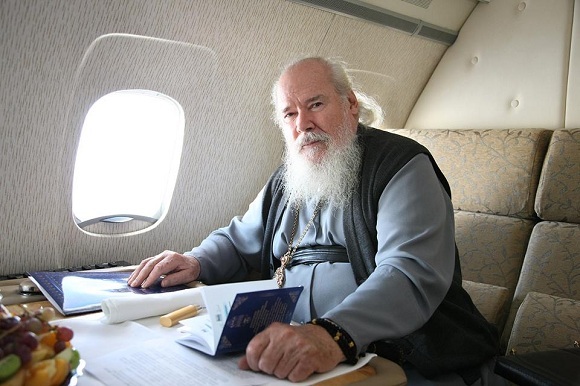 But Patriarch Alexy’s countenance was that of “one having authority,” of a person with a capital letter, of someone who knows something they do not, of someone who has some kind of connection between earth and heaven – it was this that gave rise to their delight, surprise, and even fear. He had another trait that is rarely encountered in modern life. Accompanying him during his last four years or so of labor (both on his travels and during services), I likewise watched people’s faces. When people met His Holiness, it was as if some sort of switch were turned on inside them and they began to rejoice when they saw him. I saw it on the faces of monks, nuns, and parishioners: they immediately broke into a smile inspired by joy. This was done entirely instinctively; they themselves did not notice it at all. I even saw how the faces of bureaucrats, normally frozen into masks, would suddenly show something childlike and immediate; their faces would come to life, while their masks vanished somewhere. 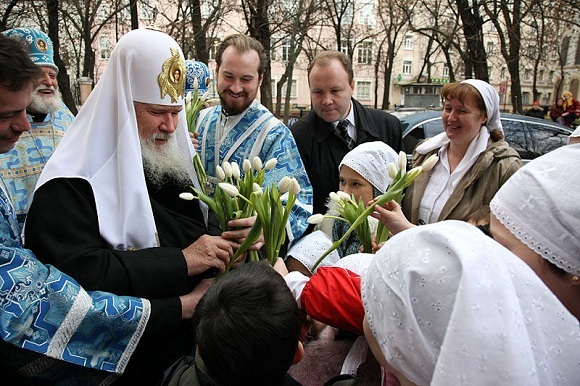 We must give due to His Holiness: behind the Patriarch’s countenance lay not simply wisdom, experience, commitment to tradition, and the particularly conservative image of a Russian man – a bearded, solid man carrying a staff. No, something in him gave off an otherworldly, radiant, Divine light that transformed people. Others can confirm what I have said, for these things were visible to all who interacted with him. I would like to recall something connected with me personally. 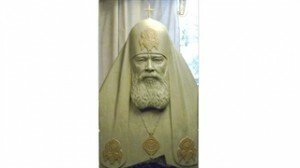 His Holiness, Patriarch Alexy, played a very large role in my life, even though I was not especially close to him. Generally speaking, he did not grow close to people, although he did have his own circle of close friends whom he trusted and with whom he probably confided. I was not one of them: I was simply an assistant who worked with him. Nevertheless, my priestly and professional fate of the past fifteen years has been connected exclusively with him. I had several long conversations with him – an hour, an hour and a half – during which he told me a great deal about himself. It was as if he were thinking about how to keep all this from getting lost. So, for instance, he told me about how his grandfather had been a White Guardsman who had been executed. When I began to mention this to other people, they would say: that’s the first I’ve heard of it! It turns out that he entrusted the history of his family to me, although this had never been written down anywhere and he had told very few people about it. Why did it work out this way? He questioned me about the fate of my parents and grandparents. I told him that my grandfather was a Frenchman who had lived and worked in Leningrad and was then shot as a French spy here in Smolensk, and that my great-grandfather had come to Russia as a representative of the Batignolles company that built bridges in various Russian cities, primarily in Petersburg. Suddenly I understood that he found this very exciting. I think he found something related, some kind of parallel, between his Russified German ancestors and my Russified French ancestors. It was in reply to my account that he started to talk. I suddenly saw that he had somehow “connected” with my life and had perhaps found something that was familiar to him, and then told similar stories connected with himself. During these personal encounters I was struck (and later I confirmed this impression with others) by his interest in people’s professional activities. He knew that people could express themselves through their professions and thereby be useful to God, people, and the Church. He tried to make use of people’s professional abilities along lines that were useful for people and the Church. He “fished out” and gave his blessing to the initiatives of professionals in various fields – educational, cultural, pedagogical, organizational, construction – giving them impetus and helping a great many people. If he saw in people the desire to do something good for the Church, he did not simply support them, but did everything he could for them. He remembered people first in terms of their aspirations, and later in terms of their actions. He might forget the circumstances connected with one person or another, but he would always remember their actions very accurately. During encounters with them he would always remember this. Much of what was accomplished in the 1990s was done thanks to the Patriarch’s personal support of various initiatives that arose among people. It is interesting that, from the outside, there did not seem to be any clear system in these various activities, because the ecclesiastical, societal, and spiritual life of the time was like a desert that had not seen rain for ages. One had to add all sorts of fertilizer and then sow it for something to grow there. This was a difficult task. And he, oddly enough, relied on people rather than ideas. So what someone could do is what he should do. If it doesn’t work out – well, then he’ll leave himself. His Holiness understood, of course, that first of all the centers of spiritual life had to be revived: Optina, Diveevo, the Trinity-Sergius Lavra, the Cathedral of Christ the Savior, the theological schools, and so on – and then later, like ripples, they would expand and overtake everything else. But he also understood that without people all this would be useless. The moment someone appeared who had something to offer, he would support him completely. To be perfectly honest, I do not know of a single case when someone went to the Patriarch with some idea he had worked out and then was turned down. In this sense, he was very trusting of people. As such, it is possible that there were people who made many mistakes: things didn’t work out; something came undone. But the very idea of supporting people and relying on professionals in their fields was very important and necessary for those times (and, perhaps, for other times as well). Here is how he “caught” me with his nets and tackle: he understood that I had a certain skill and experience – well, then, do what you know how to do and in which you have experience! This was important to me, since it gave it a sense of meaning. When I left behind literary bohemia and the artistic atmosphere, the literary milieu and journalistic get-togethers, it was specifically in order to become a pastor and to engage in entirely different matters. Then suddenly – back I went! With the Patriarch’s blessing, I spent five years as the dean of a department of journalism and also worked in the press office. Outwardly this looked odd: why had I gone into the Church if I was still doing the same thing? What about the ministry? But no, this journalistic activity was entirely different than before; it was a different kind of thing altogether. I am grateful to the Patriarch for experiencing this method of “luring” the right people into the Church. The Patriarch was never alone, in the sense that he was the mouthpiece for a great many people in the Church. He also relied on the people he had around him, to whom he was grateful: bishops and clergy as well as the people who serve the Church and love God. He relied on them and never separated himself from them, bearing the responsibility of being the mouthpiece for their hopes and aspirations. His flock saw that he stood for them, that he was their mouthpiece. This connection with people was very important. He represented the entire Church and headed the Holy Synod and the Council of Bishops, but he did not see himself as being the teacher of the bishops or the “synodals”: he was always “one of,” not “first among.” He possessed the inner spirit of conciliarity. I know that he always agreed with the opinions of certain bishops and priests, but this spirit of conciliarity always had precedence over his partial differences with various people. He was very fortunate to have wonderful assistants. But also “lucky” – in quotation marks, of course, because he and his closest assistants had chosen them – were these people whose creativity he was able to bring out. The Patriarch will remain in my memory. There are very few photographs and newsreels that express the image that comes up when I speak about or remember him. It is, most of all, the image of someone praying with closed eyes, withdrawn into the depths of prayer, restoring the link between man and God –at the divine services, approaching an icon, venerating relics, standing before the Holy Table. These were rare moments, seconds. This is the image of a man of prayer, of a man of profound inner faith, of the sort that one encounters only very rarely even in church circles. We were fortunate to be contemporaries of a man who had such profound faith and such devotion to God, and the image of this man arises before me the very moment I call him to mind.